You are able to convert multiple emf to one pdf document if you choose the application of VeryPDF PDF Editor as your helper. 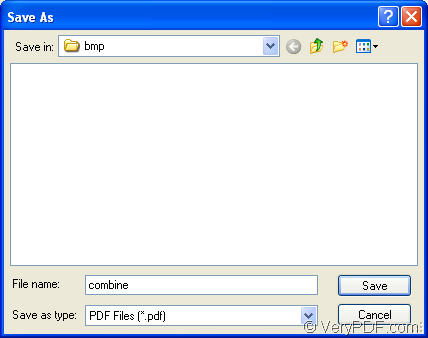 It is really a powerful document which can act as a document converter also a pdf document editor. When PDF Editor is seen as a document converter, you can use it to convert different kinds of images to pdf document, also convert the document of pdf to various image formats. When it is seen as a PDF editor, you are allowed to recreate a new pdf document by editing the contents of the document such as texts, links, draws or others. You can also use it to add your comments or annotations to input pdf document. By using PDF Editor, you can better work with the pdf document and it will be a good assistant in your work. For downloading the evaluation version of the application, please click the following link: http://www.verypdf.com/pdf-editor/pdfeditor_setup.exe. The installation is necessary for you to use the application anytime. You just need to follow the installation wizard to set up the application and you can choose to create a desktop icon of it for you to conveniently use the application. If you need to buy PDF Editor, please enter its homepage at http://www.verypdf.com/app/pdf-editor/index.html where supplies several kinds licenses which are designed for different users with different purposes. 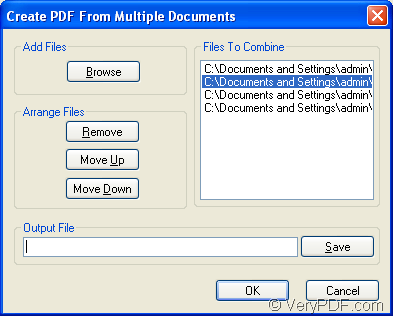 For converting multiple emf to one pdf, please use the following two ways to open PDF Editor at first. Double click the icon of it. Right click the application icon and click “Open” in dropdown list. Then you will see the interface of PDF Editor on your screen. Please click “File”—“Create PDF files”—“From multi files” to open “Create PDF From Multiple Documents” dialog box which is shown in Figure 1. Then you need to input multiple emf images into it. Please click “Browse” button and you will see a popup dialog box named as “Open” in which you can choose all the emf images that you want to convert. After that, all the files are added in the application and you can see there paths in “Files To Combine” group box. If there is some file doesn’t need to convert, please click it’s path and click “Remove” button in “Arrange Files” group box. To change the order of the files, you can use the buttons of “Move Up” or “Move Down”. In “Output File” text box, you can specify the path and name for output one pdf document or you can click “Save” button to open “Save as” dialog box in which you can choose a suitable location for output pdf document. Please see “Save as” dialog box in Figure 2. In “Save in” dropdown list, please choose the location for the target file. In “Save as type” dropdown list, just choose “PDF Files (*.pdf)” as output format. Click “Save” button to save all the changes you have made. Then it will return back to last dialog box and please click “OK” button to convert multiple emf to one pdf document. If you want to change all the operations you have made, please click “Cancel” button. 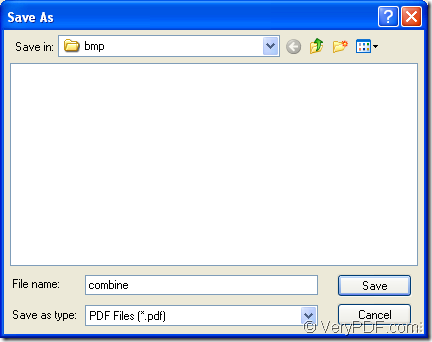 Several seconds later, you will get the single pdf document after the conversion from emf to pdf. How to type on a PDF file? This entry was posted in PDF Editor and tagged emf to pdf. Bookmark the permalink.